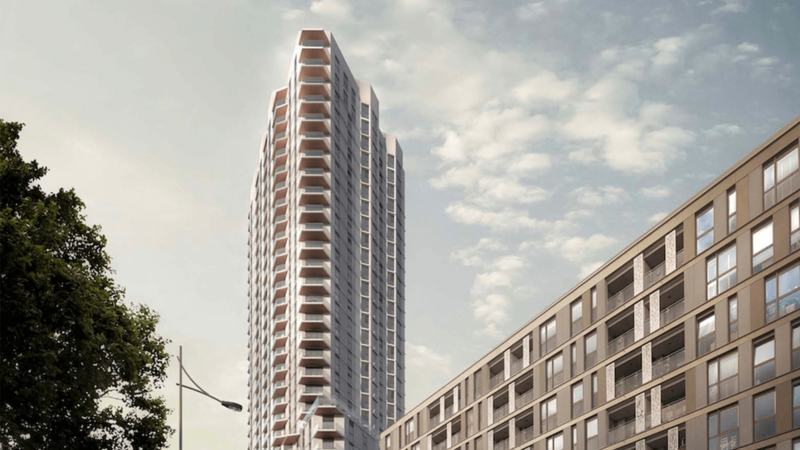 Staticus has been appointed as the façade contractor for the Tottenham Hale tower, which is the last piece of the neighbourhood’s eleven-phase re-development program. Designed to the highest environmental and design standards by Hawkins\Brown Architects, the 32 storey, 107-meter-high mixed-use tower will consist of 279 homes and commercial spaces. Staticus’ façade solution comprises a mix of unitised, stick and crown facades, balustrades, privacy screens and parapet cladding, which in total will cover close to 15,000 square metres. Architects Hawkins\Brown incorporated balconies or terraces into the design of all the apartments in the Tottenham Hale tower. These need balustrades or privacy screens, so to achieve the highest degree of privacy for each, without encumbering the view, numerous corners and columns are required. The prevalence of columns and corner elements combined with the compact nature of the site make the installation phase of this project particularly interesting. To keep to the necessary safety standards without affecting the installation schedule, Staticus will adopt an ingenious and innovative approach utilising a custom-built mobile jig. This will allow it to install the panels from behind the numerous columns. The installation process is not the only innovative solution in this project. Staticus is one of the first companies to utilise a newly-developed system that facilitates the integration of fully prefabricated sliding doors into façade panels. Its design teams worked closely with the system developers to ensure that panels fitted with this new system work as intended. .
For more information, please visit www.staticus.com.